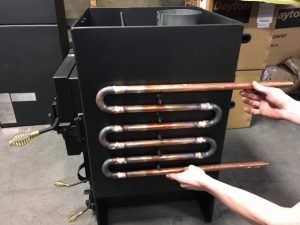 Why A Kuuma Wood Burning Sauna Stove? 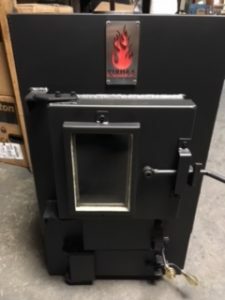 All Kuuma wood-burning sauna stoves take a 6″ black 24 gauge stove pipe that should then transition into a class A stainless steel type of chimney pipe. Please see the operators manual for recommended set-backs from combustible materials. 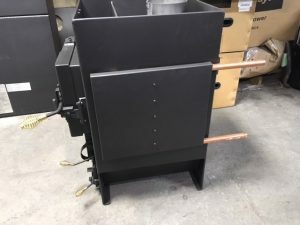 A throat extension (also known as a through-wall) is a great option if you wish to feed your sauna stove from your changing room or from outside the sauna building. 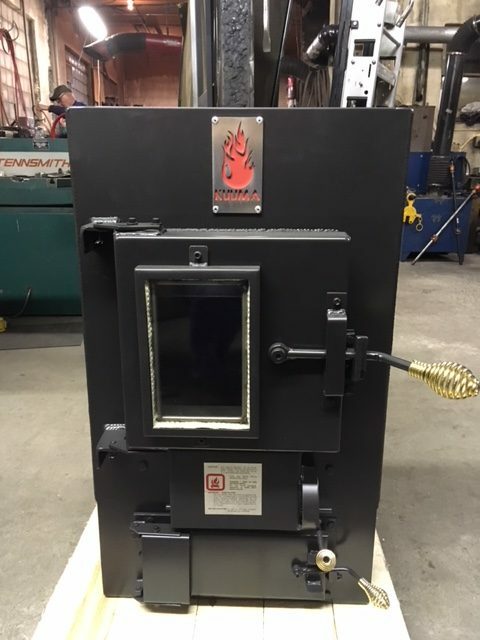 We offer an 8″ throat (as installed on the stove in this picture or a 12″ (standing next to the stove). 12 inch is normally used for log cabins or rock foundations that are extra thick. It is a very good idea to also add an ash-pan option if you use a throat extension to make it easier to remove the ashes. Ash pan clean-out. Includes a slide-out ash pan with a cast iron ash grate. Ash removal made simple and clean. The hot water coil gets mounted to the side of the Kuuma Sauna Stoves. 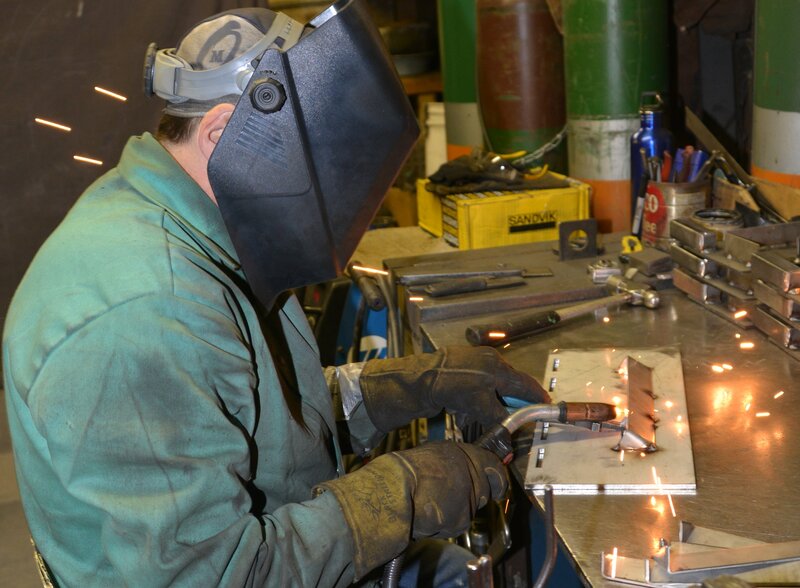 This coil can be mounted on either side – please specify which side when you order. The hot water coil is then covered with an exterior shield. Simply solder 3/4 inch copper fittings to attach to your hot water system. Ceramic window easily resists heat and tends not to attract black soot. Window size is 5″ x 8″. 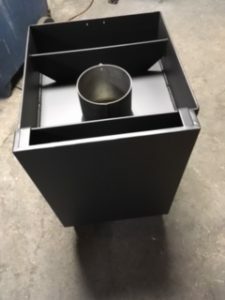 Heat Shields are available for the sides and back on all sizes of Kuuma Sauna Stoves. They simply hang on steel tabs from the top edge of the stove. 12 gallon tank fits small and medium Kuuma. 16 gallon tank fits the large Kuuma. Is the metal heavy enough to prevent warpage? Yes, it’s constructed of 1/4″, 3/8″, and 1/2″ plate. Is it brick lined and baffled? Yes, its brick lined to also prevent warpage, and coupled with the baffle, enhances the burning of gases. 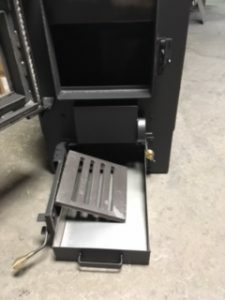 Is it an air tight stove? Yes, the only air it gets is what you set on the carburetor. The doors are sealed for air tightness. Can you heat water for bathing at the same time it heats the room? Yes, with the optional 12 or 16 gallon stainless steel hot water tank water heats very quickly. 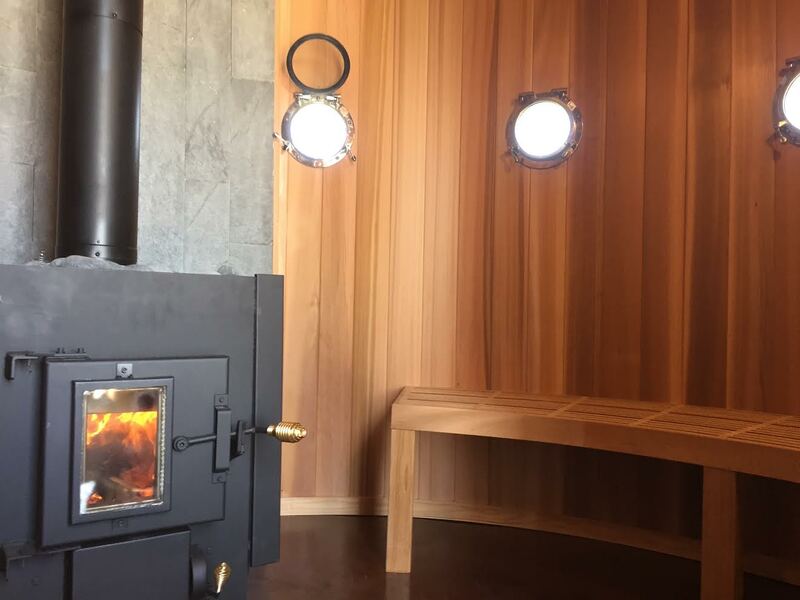 Yes, if ordered, an optional 5″ by 8″ glass window is available to watch the burn and make your sauna experience even more romantic and enjoyable. What size room will it heat? 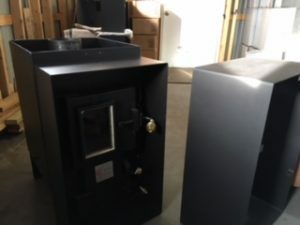 Based upon how well the heating room is insulted, the small stove is for up to an 8 x 8 x 8 room, the medium is for up to 10 x 10 x 8, and the large is for bigger saunas. 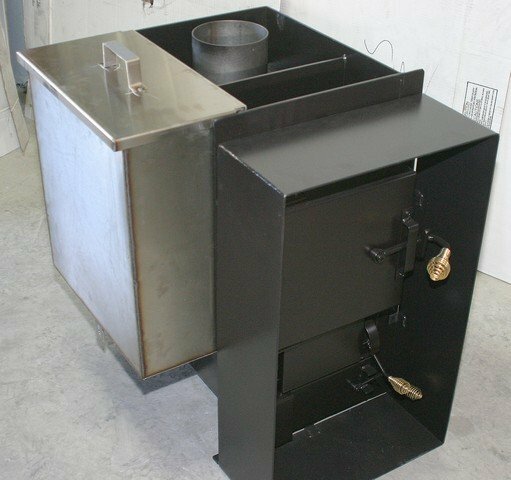 What length wood works best for each sauna stove? 16″ wood lengths for the small and medium sauna stoves. 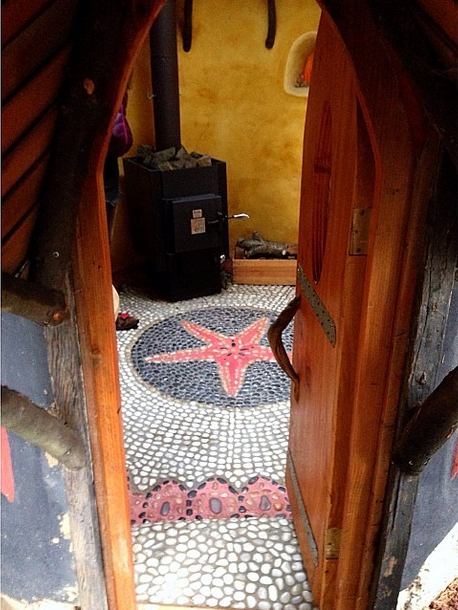 20″ wood lengths for the large sauna stove. Can you load wood from outside or from the dressing room? Yes, the 8″ or 12″ optional extensions are used to go through the wall. 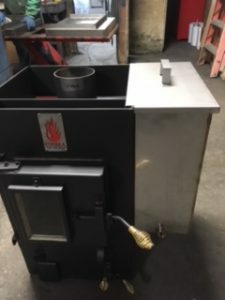 When I purchased my Kuuma Wood Sauna Stove from you in the summer of 2008 - I figured i'd give it a few years of use - and Then decide if I wanted to send you a glowing review of it. Well - after my 3rd winter of regular use on it - I can't say enough good things. I absolutely love the stove for a number of reasons. - It burns incredibly efficiently. 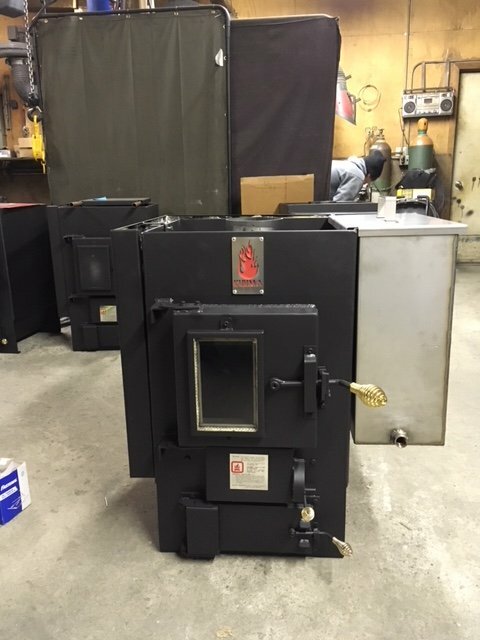 Starts with very little smoke and progresses to No smoke and burns very efficiently with excellent heat output. - The chamber and exhaust design is such that it puts no sparks out the chimney at all. Not sure if this is intentional or a byproduct of the burning efficiency of the design - but the way the stove exhausts above the door - moving the hot air under the rock carriage - and out the flue at the rear - provides not only excellent heating - but in three years I have never been able to see a spark coming out the chimney - and I burn a lot at night. -The actual design of the doors and hinges makes them very easy to remove for maintenance. I have found it desirable to hit the stove doors with some hi-temp paint every couple of years for aesthetic reasons. I have come to appreciate greatly the many small design decisions you've made to make this very easy. Read what our satisfied customers have to say here.